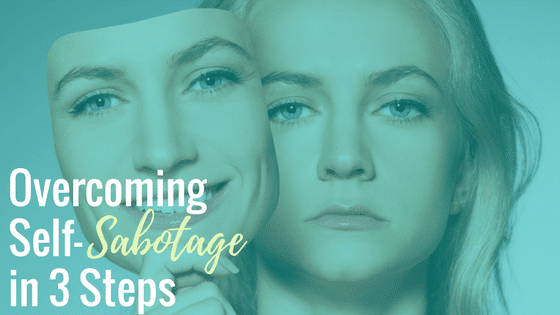 Self-sabotage seems to be the #1 obstacle that most people struggle with when it comes to weight loss, consistent healthy eating and exercise. I was recently working with a client in my Balanced Eating Breakthrough Program who expressed that no matter how many times she would go on a diet, she would end up sabotaging herself. She would start off strong, and do great for a couple of days, but then something would snap and she would go off the rails. She always pretended that she was good, and that she had it all together, no matter what was happening in her life. She didn’t want anyone to know if she was struggling or having a hard day. She felt like that would make her look weak or incompetent. So she hid behind a fake smile. And that led her to sabotage every time. When we hide, we are being untrue to ourselves and others. We are being in-authentic and fake. No one can know the real us if we are hiding behind what I call, safety masks. I use to be a master at hiding…. Behind being a “good” girl. Behind Needing to Look and Be Perfect. All that hiding resulted in a tremendous amount of suffering and consistent self-sabotage. It also drove me to overeat, binge and use food as a crutch. When we hide who we are for fear of being judged, looking stupid, being seen as a weak or whatever other god-awful judgement we have, we are disconnected from ourselves. Being disconnected from from ourselves, is the fastest track to self-sabotage. There are many ways we hide…. When I asked my client what would happen if people really knew the truth about her, she burst into tears. She couldn’t even fathom that anyone would like her if they saw her “not-so-nice” side, or if she really spoke her mind, or asked for what she wanted. We all come into the world the same way; as a little bundle of pure, unconditional love and joy. We have no language, no belief systems, no ideas and no awareness of our ego. We are happy and present. Over time, as we grow and learn, all kinds of things are projected on to us from the outside world, and those closest to us. Some of us grew up without loving parents, or we had parents who expected a lot from us, or there were kids in school who were mean, or teachers who didn’t believe in us. We may have received a lot of messages of not being lovable, worthy or good enough. Whatever it was, these messages were programmed into us as a belief system during the formative years of ages 0-9, as we create our core memories. The challenging part is that we take those belief systems with us into adulthood without any awareness of them and they usually end up running the show without even knowing it. They show up in the form of self-sabotage, overeating, food struggles, addiction and more. We keep experiencing the same challenges over and over, and we don’t understand why. Get brutally honest about who you want to be in the world. Ask yourself what would truly make you happy and take one step toward whatever that is for you. When I was in the spirals of sabotage, I felt as though I would never get out. I thought I was broken and needed some serious fixing. What I learned over the years in my healing journey, is that I wasn’t broken, I was hiding. I wasn’t being true to myself, or anyone else for that matter. I began to take a deeper look within and ask myself some important questions about who I wanted to “be”, and how I wanted to show up in the world. The answer that came was profound at the time, because it wasn’t about anything external, or anything I could acquire. It was all about being an example of love, authenticity, presence and inspiration for others. Start to share your most vulnerable truths with others you trust. Let people know you are struggling. Be transparent. We are so trained to not show vulnerability for fear of being deemed weak, and consequently we often pretend everything is o.k., even when it’s not. This can also drive us straight to the refrigerator. So, find the person you know will hold your deepest truths in confidence and share from the heart. I guarantee you will feel a sense of freedom, and as a result self-sabotage will start to lessen. Practice Self-Compassion and Kindness. None of us are perfect or have it all together. It’s completely impossible. Most of us have an inner critic that is relentless. That inner critic is your biggest saboteur. Start to become aware of the mean things you say to yourself, and turn them into a statement of compassion. For example, if your inner critic keeps telling you that you are a failure because you can’t stay on track or keep weight off, then it’s time to hush that voice, and find a different thought instead that is more empowering. When my inner-critic rears her ugly head, I hear her and literally say, “STOP,” out loud. Then I redirect that thought to a place of self-compassion and kindness, by telling myself I am OK just as I am, and I am doing the best I can. This helps me to stay present while also stating something that is believable versus lofty. You don’t want to pendulum swing too far away from the original thought, because your inner-critic will definitely balk. Furthermore, breaking the pattern of Self-Sabotage takes time, consistency and patience. It doesn’t happen over night. These ingrained patterns need a lot of attention and action. You are responsible for making the change in your life and remember, you have the power to make a choice. Your inner-saboteur doesn’t have to run the show. If you practice these 3 tips regularly you will begin to feel your inner-saboteur fade into the background, little by little and you will feel more empowered each day! If you want more incredible actions to support you in overcoming your struggles with food, then enter your email below to get my Food Freedom Guide; 7 Inspired Actions to Transform Emotional Eating and Make Peace with Food.